All reverse osmosis storage tanks supplied with Purestream Undersink Water Filter units are of steel construction, with all areas in contact with water made of EU standards compliant stainless steel. 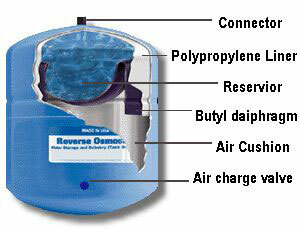 Tanks are pressurised to 7-9 psi and contain a quality, virgin sourced, food grade bladder that holds the water. 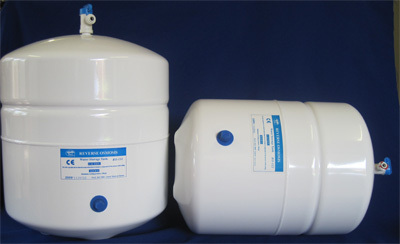 A pressure valve is situated towards the base of the unit and covered with a blue sleeve. Pressure should only be adjusted if unable to get water to the faucet and tank appears to still have considerable water. 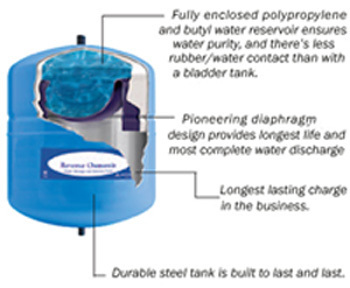 Each diaphragm is post cured prior to construction ensuring tastless, odourless, pure water.